Discover Wyoming’s wild side with your curious buckaroos in the dynamic-duo National Parks of Grand Teton and Yellowstone on our Grand Teton Family Vacation.From the craggy peaks of the Tetons to the whimsical mosaic of geothermal activity in Yellowstone, this all-inclusive, action-packed family vacation is the perfect blend of adventure and education. 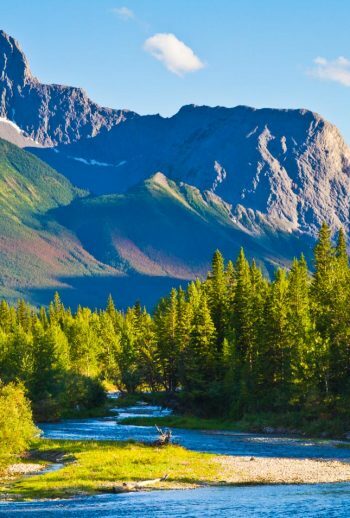 Kayak beneath towering mountains, bike through spectacular valleys animated with wildlife and wildflowers and create unforgettable memories rafting the Snake River. Days are bookended with the best in western hospitality at iconic park properties and picturesque cabins as our expert guides fill the moments with Austin’s signature touch of inspired, thoughtful service and endless daily delights that make this a family vacation you and your Junior Rangers will never forget with this Grand Teton Family Vacation Package. On our Grand Teton Family Vacation, shooting geysers, soaring mountains and alpine lakes are the perfect backdrop to this six-day family adventure exploring the best of the wild, wild west. Our expert guides introduce you to one of the most fascinating destinations in the world on this intimate, custom journey into the picture-perfect scenes of Yellowstone and Grand Teton National Parks. The rare wildlife sightings: Keep your eyes peeled for nesting bald eagles and great blue herons on our raft trip through the Snake River Canyon. The bike paths: Jackson and Grand Teton National Park are full of smooth, beautiful bike paths and they just keep building more! Two completely different national parks in one trip: See up close the differences between volcanic Yellowstone and the glacier-carved valley of the Tetons. Enjoy a leisurely breakfast and a ride up the Jackson Hole Tram to take in views of Grand Teton National Park from high up before drop-off at the airport or your post-trip hotel. Discovery: Learn the geological differences between Yellowstone and Grand Teton National Parks. Hear both sides of the debate concerning the migration patterns of bison from Yellowstone Park. Have you ever spotted a moose in Moose, WY? Have you heard the splash of a geyser’s eruption as its water crashes to the ground? Did you know that “hole” was the term for “valley” used by fur trappers during the late 1800’s, and Davey Jackson helped settle the Tetons area, hence the name “Jackson Hole.” Investigate for yourself the difference between Yellowstone’s four geothermal features: spouting geysers, steaming hot springs, hissing fumaroles, and bubbling mud pots. Stare 1,000 feet down into the V-shaped gorge of the red, pink, yellow, and orange splashed walls of the Grand Canyon of the Yellowstone River. Search for grizzly bears, bison, elk, pronghorn, and coyotes in the rolling, sagebrush-dotted hills of Hayden Valley. Soak up the beauty of the Cathedral Group: Nez Perce, Middle Teton, Grand Teton, Mount Owen, and Teewinot as you pedal along one of Jackson’s many bike paths. Come discover the fun to be had in the Cowboy State with the leaders in adventure travel!